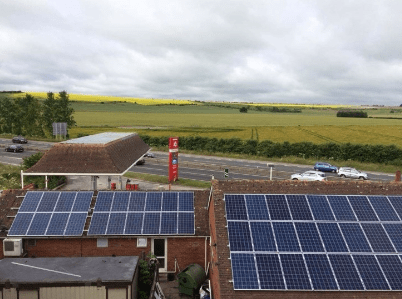 A Case Study from CPSL-Group’s Marc Stanton on powering an off-grid motorway gasoline refuelling station in the UK. When we were introduced to this site, the power was being generated entirely by 2 diesel powered generators. There is no mains power to the site and no possibility of mains power supply for the site being available in the future. The monetary and environmental cost was high, diesel generators were running for 24 hours per day, often extremely inefficiently due to low demands overnight and at times during the day. Also due to the constant running of the generators, service and maintenance was a regular cost. CPSL Group initially installed half hourly energy monitoring to gain some insight to the power use on site and from this data, specified a system using solar PV, and battery storage. We also installed an electric vehicle charger for Clients of the service station to use. Save energy through use of self generated electricity. Reduce running hours of the generators. Reduce servicing costs of generators. Use of the generator at peak efficiency levels. Access financial incentives of renewable energy installations through the feed in tariff scheme. 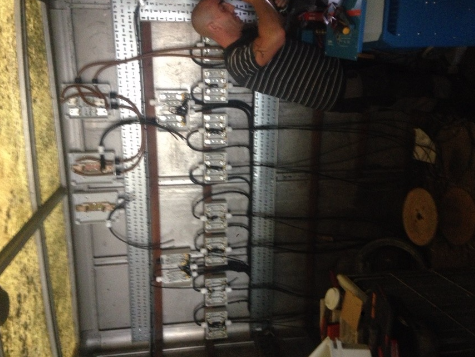 Initially, 20kW of battery charger/inverters were installed with 36kW of Aquion saltwater batteries. This installation provided immediate benefits to the site. Monitoring of the site switched from half hourly monitoring to live monitoring via the inverter/charger software. During the summer months the system continued to perform very well but as the days started to draw in and become shorter with less generation from the solar panels, weaknesses of system performance became evident. Due to the characteristics of the Site demand, Charger/inverters and the battery technology, it quickly became apparent that both the initial monitoring system installed and the Charger inverter monitoring were not recording data with sufficient accuracy to gain a true insight to the requirements of the site. These findings prompted the installation of a second by second individual circuit monitoring system for the entire installation. This monitoring enabled an extremely detailed study of the power demands of the installation, as well as enabling identification of inefficiencies and wasted energy. This new monitoring system gave much greater clarification of maximum demand and start-up energy required from the system. With this data we were able to identify that the main weakness of the initial installation was the voltage drop across the battery bank during very short but high maximum demand currents. 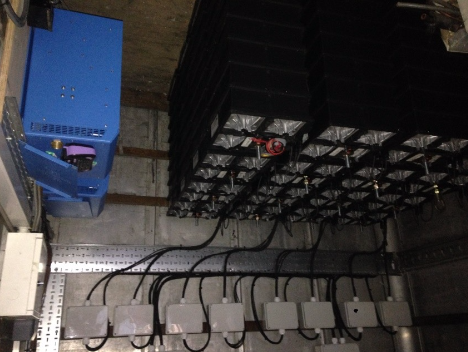 The solution was to add a further 18kW of battery storage, this had the effect of maintaining the voltage of the battery bank at a level higher than the cut off point of the inverter chargers and allow for the time required for the generator to start during sustained high site demand.